Ratchet sheaves have a rope groove design which grips the line, and an internal mechanism that allows the sheave to rotate in one direction. An operator can raise an object by pulling a rope in the direction of rotation and the sheave grip and mechanism preventing it from rotating back provide “holding power” which relieves the load required to hold the object, and operator fatigue. The line can be eased when required by allowing it to slide back over the stationary sheave. Ball bearings minimize friction and the effort required to raise the object. 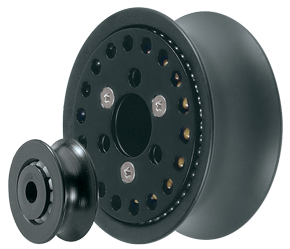 Acetal sheave with Acetal ball bearings – efficient, lightweight all plastic sheave assemblies with ball bearings to take axial and thrust loads. Totally corrosion proof. Alloy sheave with Torlon® ball bearings – oversize Torlon® ball bearings minimize friction and provide superior rolling performance. 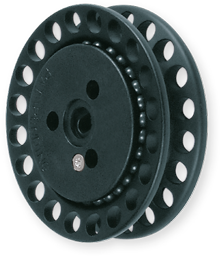 The narrow anodized alloy sheave is ideally suited to small diameter modern fibre ropes. Alloy sheave with Torlon® rollers and Acetal ball bearings – the ultimate high load, low friction sheave package. Torlon® needle rollers provide extremely high axial load performance and Acetal ball bearings counter thrust loads. 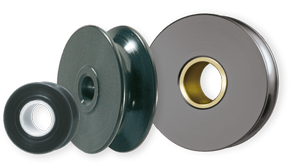 Alloy sheave and components are hard anodized for corrosion resistance and durability. 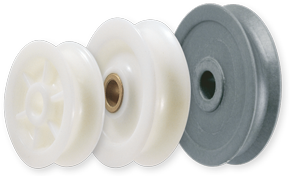 Acetal – the fundamental moulded sheave material with excellent U.V. and dimensional stability combined with the proven self-lubricating properties of Acetal. Acetal sheave with Oilite® bearing – reliable moulded Acetal sheaves with an oil impregnated sintered bronze bearing for high load performance. Nylatron® – A partially cross-linked polyamide (Nylon) compound, modified with MoS2 for lubrication to enhance free running and minimize line wear. Aluminium sheave with Oilite® bearing – light but strong and durable aluminium sheaves with an oil impregnated sintered bronze bearing for high load performance. Brass – durable marine grade brass, chrome plated for corrosion resistance and appearance. Dissimilar metal properties ensure free running on stainless steel shaft bolts.